Mierce Miniatures is showing off another stretch goal for their Darklands Kickstarter campaign and it's a biggie. £60,000 has now been passed - a superb effort from everyone! - which means the Fomoraic unit, The Eye Ascendant, will now be produced. 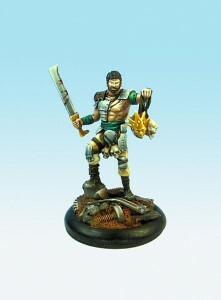 The Ion Age have released their new Khanate Warlords over in their webshop. Hulking brutes that carry weapons capable of destroying battlesuits and vehicles Warlords are giant Humanoid aliens that give most Khanate formations the back up needed against the Retained Knights of Prydia. 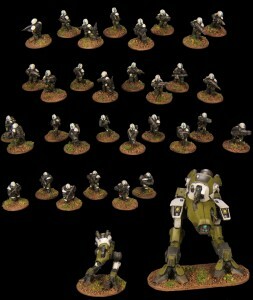 This set contains the following white metal modular pieces in 15mm scale. Five different Warlord bodies in five poses, five random Warlord heads taken from three different designs and five different weapons. The weapons are a Jupiter 46mm Plasma Treble Rifle, the Mars 20mm Chain Cannon, the Maia 12.7mm Scatter Cannon, the Helios 80kw Atomic Destabliser and the Juno 18kw Laser Cannon. These pieces allow seventy five different combinations of assembly for everything from Warlord veterans to legion, pioneer roles and bare headed . An assembled Warlord stands about 30mm tall on average. Since we first mentioned the Khanate Warlords in a February sneak peek we have had dozens of emails asking about them and now they are here. 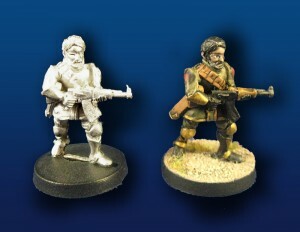 They are our last release before the Salute 2014 wargame show on April 12th 2014. You can get 15% off all orders and choose to collect your order from us on the day at the trade stand. We will have our full 15mm range with us. Remember the current free miniature in all orders IMP07 Female Muster Patrol Officer is retired at the end of March and will be replaced on April 1st. By placing an order with us you will sign up for an account with the website and that means you get Reward Points in all purchases (plus a free miniature and you can use the current salute code). These points can be used any time to get free products and discounts on orders. Click on the link to read and see more. Thanks. Taban Miniatures is running a profile-design contest for Eden. Your rules could be what everyone gets to use. If you are on gladiators movies and a Spartacus fan boy, this one is for you ! Contest rules and Dantes background explained on the website. Alban Miniatures has a whole bunch of new Napoleonic releases as well as pre-orders they're taking for their line. Alban Miniatures Napoleonic masters for the 1/56 scale Austrian Cuirassiers are complete and heading to the mould shop for creation of production moulds next week. We have added to their 1/56 scale Napoleonic Austrian Line infantry with the launch of their Austrian/German Grenadiers and Fusiliers in helmets. 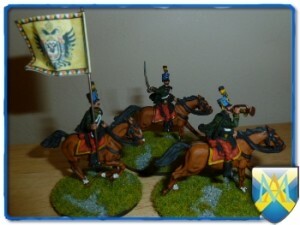 As you probably now know Alban Miniatures have been hard at work bolstering up its Austrian Cavalry to add to it's already launched Hussars. The master castings of its 1/56 scale Uhlans, Cuirassiers and Dragoons have now been sent for production and you can place your pre-orders now. 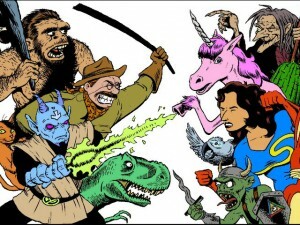 OhioHammer has posted episode 14 of their Mantic Radio podcast up online for your listening pleasure. Today Andrew and Mark are joined by special guest Jake Thorton. Jake takes us through his life from conception to creating such projects as Dreadball Extreme, Deadzone, Mars Attacks, and some possible future projects in the future! Grimsby Wargames Society, the Saints of Caffeine Hands, has some more free banners available to download from their website. As the title says its unoffical, even though the Badmashes carried flags nobody really took much notice of what they carried, proberly green and black flags plain or with solgans ect. From a wargamers point i thought i will let my imagination take over and come up with more flamboyant flags for my mobs so i created 10 flags in total, these might not stay on the table very long but at least they carried a nice looking flag, they are free for all to download with many more flags on the website. A4 sheet of the 10 flags on the website to download and print out. Micropanzer knows some of you gamers are feeling the Kickstarter burnout. So instead of going that route, they'll be doing vouchers instead. We am working on getting back up and running full speed ahead – we have so many new codes to put into production and a set amount on hand to get started . 2013 was basically a development year and am very happy with new items. We have done the math for a kickstarter and while it does seem very appealing at first what we don’t like is that 10% or so goes to the kickstarter/Amazon people – not a huge deal for what they can help you do but we would rather pass the 10% on to the end customer to save . So from now until April 31st we will be doing my own fund raising in the form of voucher pledges – We have the last master mold being made and once they are in hand and cleaned will pull trigger on production mold - a number of production molds are all ready being worked on – so this will happen regardless of people buying vouchers –We am hoping the voucher program allows us to do it faster in one go verses over the course of the next 6 months – Plus it give you the customer a nice discount. Spartan Games is offering free shipping on all orders from their webshop this weekend. We're giving you the chance to get FREE SHIPPING on all orders placed in the Spartan Games Online Store this weekend. To save on shipping, just enter coupon code FREESHIPPINGTW during checkout. The coupon code is active now and will be until Monday 31st March so be quick if you want to take advantage of this fantastic opportunity. Victrix, along with all of their special sales and deals going on, also is having a contest where you can win some free box sets from them. Not only are we offering you this great 20% off all Napoleonic boxed sets deal, but everybody who buys an item from Victrix online, by mail or telephone between the 27th March to 9th April will automatically be put into a prize draw to win 4 boxes of their choice! We will send you a voucher which you can then use whenever you want some goodies from Victrix! This also means you can use this on our excellent new products which will be going online over the next month or so. 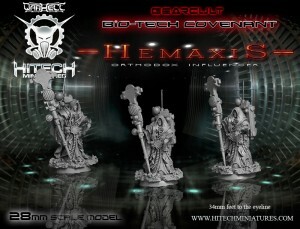 Hitech Miniatures has released their new Hemaxis mini over in their webshop. One , multipart (6 pieces) , highly detailed 28mm scale miniature made in resin which comes unpainted and may require assembly. Micro Art Studio will be headed to Salute in a couple weeks. For those that order stuff from their website and pick it up at the show, they're offering a special deal. Talking Cartoon Rabbits has launched a Kickstarter campaign for Triptych, their game of Anything vs. Everything. Freebooter Miniatures will be at Salute in a couple weeks. Will you be there? I won't. I'll be in Boston. Salute 2014 – where to find us! As you may already be aware, we will be visiting London on Saturday 12 April 2014 for the 24th annual Salute. 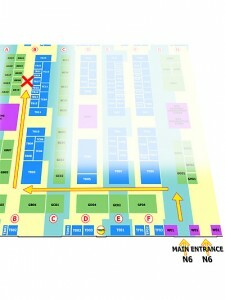 Our stand has number TB 17, our demo table is close by and has number GB 18. Salute opens its doors from 10 AM to 5 PM. World of Twilight is looking for some more playtesters to add to their group. 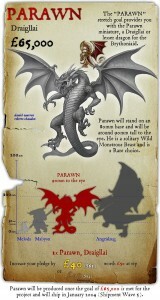 Also, they've got some new concept art and previews up on their Kickstarter campaign that's in its final days. I've decided to give people the opportunity to get hold of these early protoypes and to get involved in the playtesting. I am releasing a special Frenu playtest kit, which will cost £45 (plus £5 for postage outside UK). This won't be to everybody's taste, but if you want to get really involved in seeing the process of designing a new force for the game and get an early look at all the models involved then this is your chance. Storyweaver released Deniable, their new Spy story game that's free to download from their website. Want a laugh? 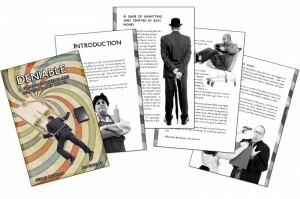 StoryWeaver has just released the pre-print beta of a story game about unwitting spies tempted by easy money. It's heavily inspired by British TV series, like SPY or Minder, or the gritty 80's thrillers like "The professionals". Deniable is an unusual game in that it focuses on the struggles the characters have in balancing their personal and secret lives. Which ends up with terribly funny situations (think, A Fish Called Wanda). Players have to balance their characters' Stress and Cred. Too much Stress, or too little Cred, and it's lights out! One big difference mechanically is that players need not form a 'party' but are always involved in every scene by formally taking on roles of 'NPCs' (we call 'em extras). It's highly entertaining and perfect for small gaming groups. StoryWeaver loves feedback, so please feel free to let them know what works and what doesn't. Fantasy Flight Games has announced the creation of their latest game, The Last Banquet. 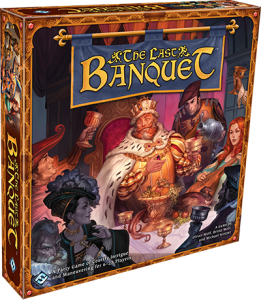 Fantasy Flight Games is pleased to announce The Last Banquet, an epic, large-group game for six to twenty-five players! In The Last Banquet, each player takes on the role of a member of the Royal Court, from the King himself, to the friendly bard, the alluring witch, or the wise seneschal. Acting out their respective roles, players must use the actions allowed to them to try and accomplish their teams' agendas. However, you’ll need to be judicious in your actions, for the King is watching closely for signs of disloyalty–and not everyone at the banquet table is on your side. 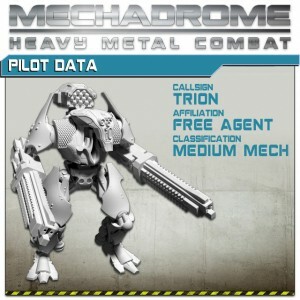 Gangfight Games is showing off a new medium mech free agent for Mechadrome with a preview of the render for Trion. Legends of Kalidasia helps you swat away those pesky fighter swarms with the release of their new Anti-Fighter Frigate. The Legends of Kalidasia Miniature releases continue for 2014 with the Heragul Anti-Fighter(AA) Frigate. These 3D printed Gatling guns replace the javelin missile launchers of the Frigate Prime to give your Heragul Squadron much improved performance against enemy fighters. 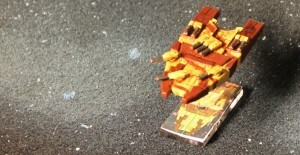 This frigate is available as a stand alone miniature for $9 or two of the new weapon upgrades are also included with the $50 Heragul Combat Force Box Set. Both of these items can be purchased on our Products Page. 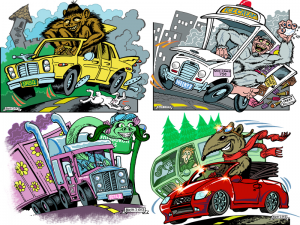 Monster Kart Mayhem has made it up and over their initial goal on Kickstarter. So it's on to stretch goals for the next 17 days. They were also on "Fund or Fail." Designer Jacob Wood appeared on the most recent episode of "Fund or Fail," a Google Hangouts show about crowdfunding projects. In the interview, Jacob discusses Monster Kart Mayhem, a family-friendly kart-racing game, which is currently on Kickstarter. Jacob talks about the campaign, why he's making the game, how it got started, his goals for the campaign, and why he chose to go with Fudge for the game's system, among other things. Monster Kart Mayhem has met its $1,000 funding goal and is on its way toward its first stretch goal, which features the Mermaid Adventures setting as an adventure pack in the kart-racing game. Battlefront features the Firefly IC for Flames of War in this latest article. 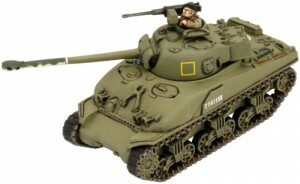 The Firefly was arguably the best variant of the Sherman to see service during the Second World War. Armed with the legendary 17 pdr gun, it gave the British and Commonwealth tankers the ability to knock-out even the most formidable tanks available to the Wehrmacht such as the Tiger or Panther. Northumbrian Tin Soldier adds to their Nightfolk line with some new releases. Sculpted by Martin Buck there are 12 white metal figures in the first release and Martin has been working hard over the last few months to expand the range . Moving forward with the miniatures our plan is to considerably expand the range over the next few months- there are another 12 greens ready for casting and the second wave of finished miniatures will be available sometime after Salute(beginning of May probably). Photographs of some of the new greens are in our news section on our new website. Critical Mass Games is headed to Salute and if you want to make an order with them beforehand, they can bring it with them to the show for you to pick it up. With the UKs biggest gaming show, Salute, looming on April 12th 2014 at the London Excel Centre, the Critical Mass Games Pre-order Page is live. Critical Mass Games has some exciting new models available at the show this year so please help us bring the right amount by getting in your pre-orders. This year we are offering those of you who choose to pre-order a 10% discount, whilst those pre-orders of £100 or more will qualify for a 15% discount and pre-orders over £150 or more will qualify for a 20% from your pre-order total. You can place your pre-orders here via our website.